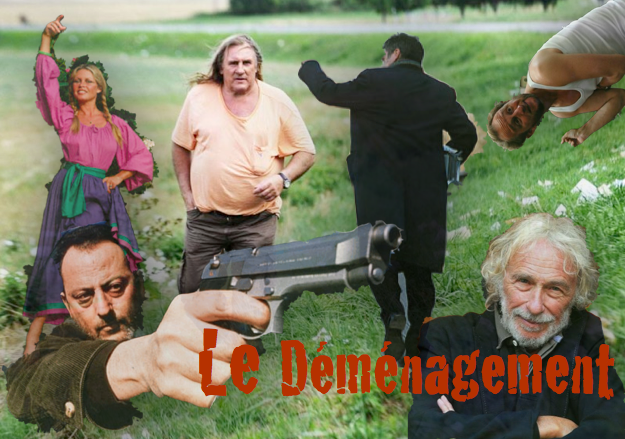 The Title: 'Le Déménagement' and will be in theatres across Europe in 2013. The Plot: A wealthy French couple, the Dépardots, played by Gérard Dépardieu and Brigitte Bardot, are hounded by the French State's tax department and collectors (Pierre Richard). Their close friend and President of the French Republic (played by Daniel Autieul) is -because of political pressure- not able to help them and advises them to move to Belgium to avoid paying huge amounts of money. They end up buying a house in a sleepy Belgian village called Estaimpuis. What seems like a simple moving of house quickly turns into chaos as they encounter the mayor of Estaimpuis (Benoit Poelvoorde) and a former Russian hitman (Jean Reno) trying to persuade them to assume the Russian nationality. 120 mins. Mrs B Productions. Cast: Brigitte Bardot, Gérard Dépardieu, Jean Reno, Benoit Poelvoorde, Daniel Auteuil, Pierre Richard.